In order to help ShareScope users who have chosen to start a SharePad subscription, we have created a tool which will allow the transfer of their ShareScope portfolios into SharePad. This tool has been added to version 7.2.0 of ShareScope. 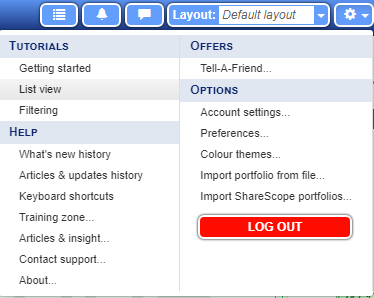 Please note that because of the portfolio structure in SharePad, only ShareScope to SharePad transfers are possible, not the other way round. 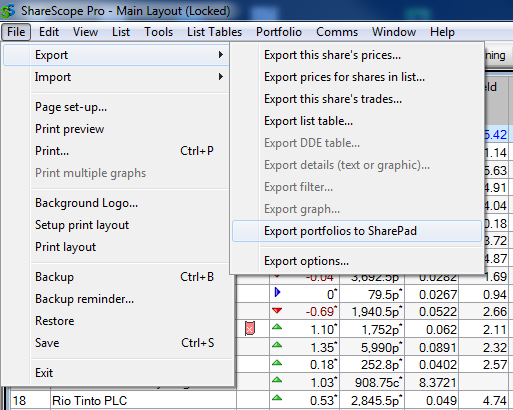 Firstly, open ShareScope and select File : Export : Export Portfolios to SharePad. Then, enter your login details in the dialog box. These are the same e-mail & password you use to login to SharePad. Make sure you receive a Portfolios successfully uploaded message, then login into SharePad. Once opened, click on the "cog" icon in the top-right corner of SharePad to bring up the Options menu. Click on the Import Portfolios button. 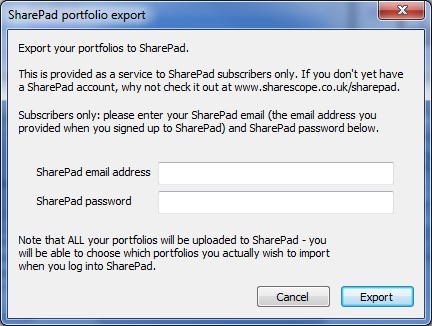 This will open a dialog box which will allow you to choose which of your ShareScope portfolios will get imported into SharePad. Select the portfolios one by one or simply choose Select all to import all portfolios. 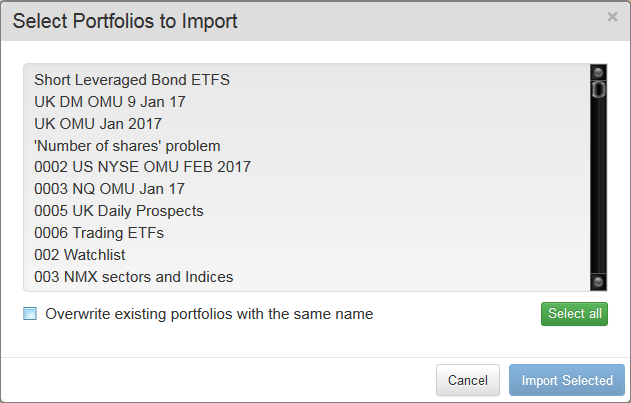 Note: if you have previously imported portfolios and wish to overwrite them, tick the box beside Overwrite existing portfolios with the same name. Once you choose Import Selected, you will see a confirmation that the portfolios have been successfully imported. To view your newly imported portfolios press the blue Port button on the main toolbar.